NETWORK UPDATE: Everything stayed as-is from this morning’s numbers. AMERICAN HORROR STORY (FX) returned with a new episode last night after taking the holiday week off and led cable, although it was down 0.38 from the episode 2 weeks ago at 1.61. 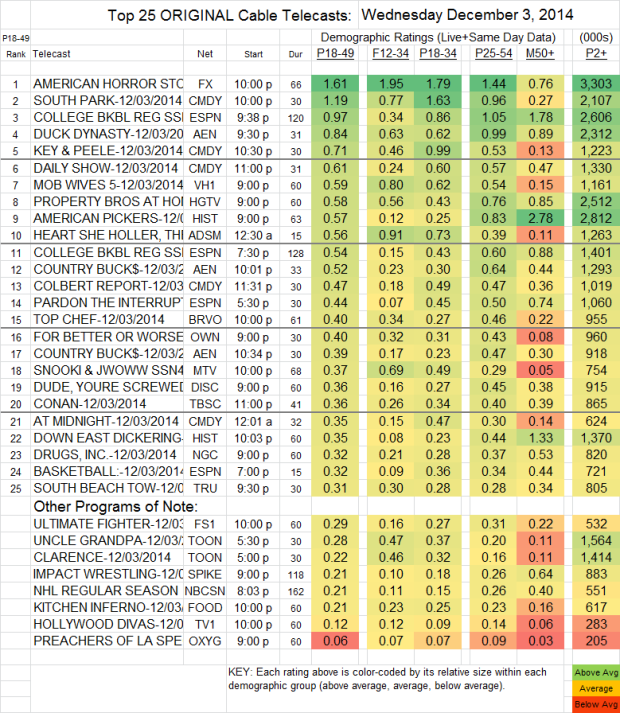 SOUTH PARK (Comedy) was also off for the holiday last week and returned up 0.25 to 1.19, and KEY & PEELE grew 0.16 to 0.71. 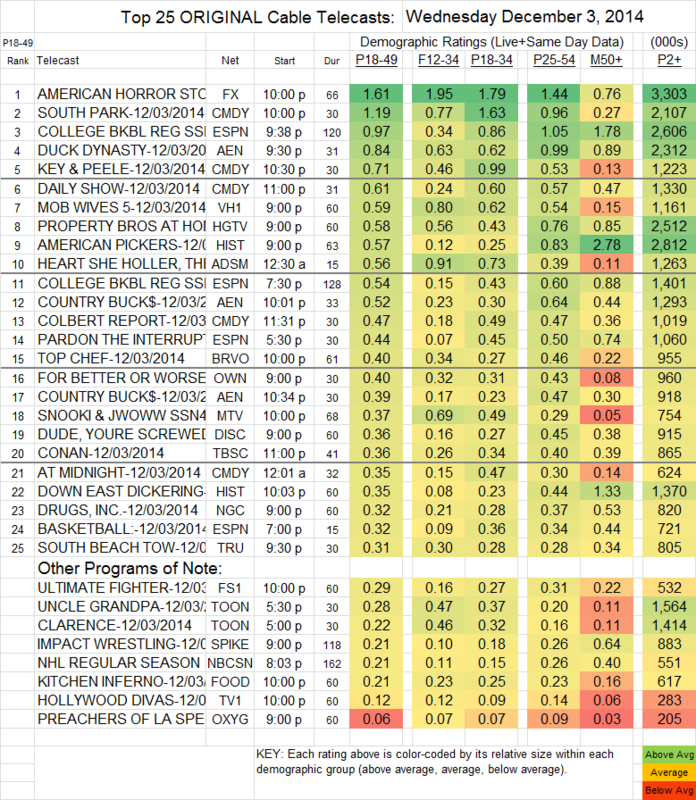 ESPN’s COLLEGE BASKETBALL games were at 0.97/0.54, the late game more than doubling last week’s 0.45. DUCK DYNASTY (A&E) fell 0.09 to 0.84, and COUNTRY BUCK$ was steady at 0.52/0.39. On VH1, MOB WIVES was at 0.59. AMERICAN PICKERS (History) climbed 0.12 to 0.57, while DOWN EAST DICKERING held at 0.35. On Adult Swim, THE HEART SHE HOLLER was at 0.56. TOP CHEF (Bravo) lost 0.03 from 2 weeks ago to 0.40, and FOR BETTER OR WORSE (OWN) rose 0.12 from last week to 0.40. SNOOKI & JWOWW (MTV) was up a tick to 0.37. HOLLYWOOD DIVAS (TV1) lost 0.05 to 0.12.